Gary Allen was initiated into IAM Local 794 in 1979 upon his employment at the General Electric Aircraft Engine Plant in Albuquerque. Following his father Ray’s example, Allen involved himself in the IAM very early in his career at General Electric by being elected Area Steward in 1981. One year later, he was elected First Shift Steward and by 1983 he was elected Chief Steward, overseeing the activities of all shop stewards on all shifts at General Electric. Allen also served as Local Lodge Auditor, Labor Relations Negotiating Committee member, Organizing Committee member, and as a delegate to, then, District Lodge 183. In 1985, at the age of 24, Allen became President and Directing Business Representative of Local 794, representing members at a variety of shops including General Electric, Greyhound, Fruehauf Trailers, and Arkansas Best Freight. He held this position until 1989 when he was appointed Special Representative. Brother Allen became a Grand Lodge Representative in 1991, and in 1996 he was appointed as the Territorial Organizing Leader for the Western Territory where he coordinated the region’s organizing activities. Allen was then moved to IAM Headquarters in 1997 as a Coordinator for Collective Bargaining and later that year was appointed Aerospace Coordinator in the newly-formed IAM Aerospace Department where he coordinated and participated directly in collective bargaining throughout North America with aerospace companies such as General Electric, Rolls-Royce, Pratt & Whitney, Hamilton Sundstrand, and Raytheon, among others. 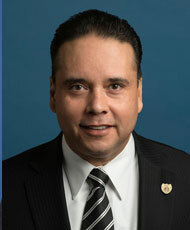 Allen was appointed to serve as the Western Chief of Staff in 2003, where he served in that capacity until 2009 when he was elected General Vice President of the Western Territory. Allen has represented the IAM as a trustee on the IAM National Pension Fund, the 6th largest multiemployer pension fund in the United States with approximately $8.4 billion in assets, providing over 80,000 retirees and beneficiaries with retirement security. In 1991 Brother Allen began serving his community as an Executive Board member of the Labor Council for Latin American Advancement (LCLAA), becoming a Vice President of the Board in 2010. Allen brings a broad depth and breadth of experience in numerous industries, from aerospace to manufacturing, Service Contract and automotive, as well as his endeavors in organizing, servicing, and representation. Allen and his wife Donna of 39 years have two sons Gary and Paul; a daughter-in-law Roberta; and two grandchildren Aubrie and Elijah. Brother Allen’s love of God, family, people and his passion for Social Justice is a guiding force in his life.